NEW YORK, April 7, 2015 – The International Academy of Digital Arts & Sciences (IADAS) today announced the Nominees for the 19th Annual Webby Awards, including Google Year In Search (R/GA), #LikeAGirl (Leo Burnett Toronto), The World’s Toughest Job (Mullen), A Trip Out to Sea (CLM BBDO) and Tinder Takeover (Circul8) are among this year’s Interactive Advertising & Media Nominees for the 19th Annual Webby Awards. Agency Nominees in the Mobile category this year, such as It’s Our Time (BBDO New York), Audi The Perfect Day (Razorfish), Puppy Love (BBH New York), and History In A Bottle Application (McCann New York) showcase the inventive ways advertising and creative agencies are engaging consumers everywhere they are, through mobile platforms. While Academy judges like Pereira & O’Dell’s PJ Pereira, Google’s Suzana Apelbaum and Anna Patterson, McCann Worldgroup’s John Mescall, Wieden+Kennedy’s Colleen DeCourcy, and Barton F. Graf 9000’s Gerry Graf will select this year’s Webby Award Winners, and the industry at large will also decide who takes home a Webby by voting in The Webby People’s Voice Awards. Last year, Internet enthusiasts cast over two million votes. Voting is open now until 11:59 p.m. PST on Thursday April 23 at http://pv.webbyawards.com. R/GA NY leads all agencies in nominations this year with an astounding 14 nominations under its belt. BBDO NY (12), 72andSunny LA (10), Leo Burnett Toronto (7), CLM BBDO (7), along with R/GA NY, are in primary contention for Webby Agency of the Year, presented to the agency that performs the best across all Webby Awards categories. Other agencies with multiple nominations also in the running for the ultimate prize, with six nominations each, are Droga5, Wieden+Kennedy, Ogilvy & Mather, WatsonDG, and DDB & Tribal Worldwide Amsterdam. This year’s Webby Awards received nearly 13,000 entries from all 50 U.S. states and more than 60 countries worldwide. From the thousands of global entries submitted to The Webby Awards, only 8% were selected as Nominees. Winners will be celebrated at a star-studded ceremony at Cipriani Wall Street on Monday, May 18, hosted by critically acclaimed actor and comedian Hannibal Buress. 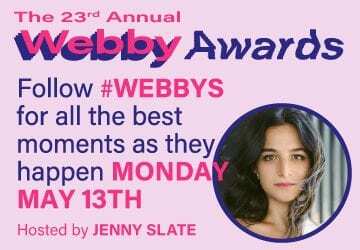 This year’s show will be available to watch on demand at www.WebbyAwards.com the morning of Tuesday, May 19. The Webby Awards video channel will feature all the show highlights, hallmark winner 5-Word speeches, special performances as well as the show in its entirety. Hailed as the “Internet’s highest honor” by The New York Times, The Webby Awards is the leading international award honoring excellence on the Internet, including Websites, Advertising & Media, Online Film & Video, Mobile Sites & Apps, and Social. Established in 1996, The Webby Awards received nearly 13,000 entries from all 50 states and over 60 countries worldwide this year. The Webby Awards is presented by the International Academy of Digital Arts and Sciences (IADAS). Sponsors and Partners of The Webby Awards include: Grey Goose, Vitamin T, Shocase, Engine Yard, AdAge, Gigya, Internet Week New York, Deloitte, Code and Theory, Happy Fun Corp, net magazine, VentureBeat, GeekWire, Techweek, Protein, 99u, FITC, SoDA, Tech Cocktail, Digital Content Next, Internetworld, The Drum, Dailymotion, and CoolHunting.